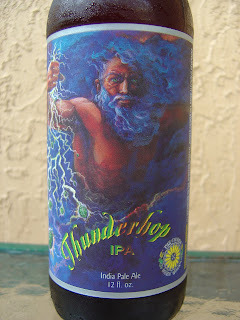 Today I'm drinking Thunderhop IPA brewed by Lawrenceville Brewery in Pittsburgh, Pennsylvania. This is another brewery inspired by Captain Lawrence, but I guess these guys go more informally by The Church Brew Works as they brew their beer out of an old and historical church. It's kind of funny that these church brewers depict the pagan god Thor (I think) with a lightning bolt whip adorned with hops at the end to cause extra pain. This one came back from my Pennsylvania trip at the end of August. Malty sweet with just a little fruity hops and spice on the nose. Bitter pine and spicy black pepper to start, but not that much. Some lemon citrus also bitters things up but I thought that lemony flavor was a put-off. There is a touch of tea and bread and toast giving some balance after that. But all of those flavors from bitter to small malt lasted one second. After that, an instant crash of flavors to nothingness zero happens and your mouth is just dry! Quite the weird quality! A little thin, medium carbonation. I guess it was OK. Hardly a Thunder-anything and hardly an IPA, though. I'd love to see that church though! And I'd probably check out another beer while I'm there. 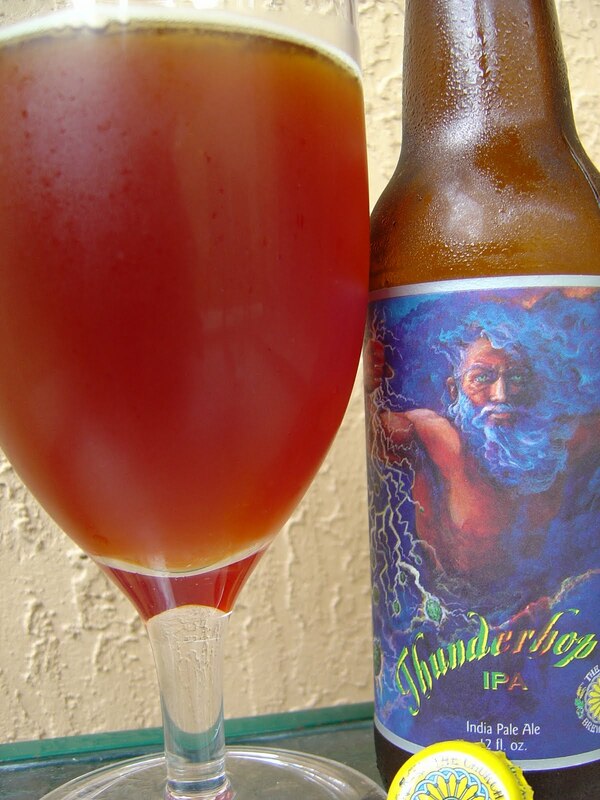 Thunderhop's actually pretty decent...it's got a not-too-strong piney/citrus-y hop flavor to it.When beer reviewers compare a beer to twenty different things(including bread) I detect a bit of snobbery for the sake of snobbery...it's just beer,man. Certainly you aren't talking about my review, with the number 20. All I mentioned were simple flavors attributed to hops and malts. You actually named 2 of the 5 I did. Pine, black pepper spice, lemon, tea and bread. Do you really detect snobbery? That doughy bready malty flavor is very common. Anyway, call me a snob if you'd like. But learn to count if that's your main thesis.